Wuzzy was a beat up tomcat living on the streets for most of the winter when a kind couple took pity on him and started feeding him, eventually letting him in for shelter at night. They contacted RCR for help in getting him some much needed vet care and a real home of his own. Unfortunately, Wuzzy has paid the price for his days as a stray, and tested positive for Feline Immunodeficiency Virus( FIV). Despite his rough start, Wuzzy is a charming, loving and gentle fellow who loves attention and affection. He's good with kids and other cats, and is always up for pets and cuddles with his human friends. Wuzzy is a sweet guy who is looking to make the most of his second chance. He's in great shape and is healthy and happy, with lots of love to give. Although FIV has long been feared as a communicable and possibly fatal illness, these myths are being dispelled. It is now widely accepted that FIV cats and live long and healthy lives just like non-FIV cats. Please click here to read more about FIV and determine whether or not a cat with FIV is right for you. 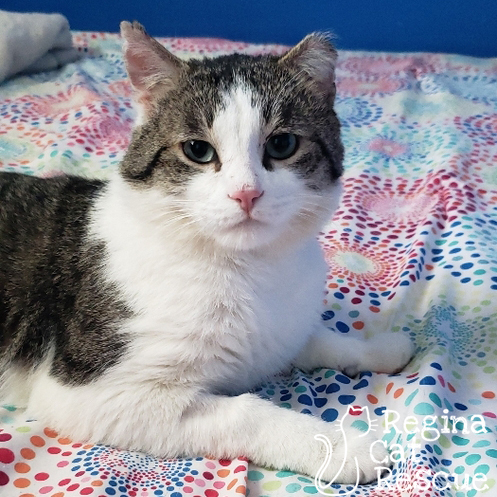 If you are interested in Wuzzy, click here to view our adoption contract and click here to complete an adoption application or email the RCR Adoption Coordinator at adoptions@reginacatrescue.com for more info.